Do you ever have that feeling when you know you need to do something, but you just don’t want to do it? Even more, you actually really want something for yourself but you can’t get yourself to do it? Years ago though, this was not me. An athlete who loves to move my body, I was self-motivated and eager to make the time, get dressed, tie those shoes and workout. Even during my 10-year season of staying home with my kids, we carved out time for walks and bike rides and hikes and being outdoors as part of our daily routine. I had a gym membership and played tennis 3+ days a week and in the winter, I loved dropping them off in the kid's area so I could have some me-time and movement time. Three years ago, however, things changed. Not only were all my kids now in school full time but I was working full time and I was also in the thick of a Lyme Disease diagnosis. I would rather sleep in as long as I could than get up at 6 a.m. to workout. I would rather nap and crawl in bed in the afternoon than tie those shoes and get outside. And to an extent, that was okay. I was listening to my body and honoring her need for rest. But my body also really craved movement. I just couldn’t get myself to do it on my own. Tennis was helpful. Most days were hard to get out of the house to go, but because I registered for the classes I showed up. Two years ago, however, I stopped playing tennis, because my body was so inflamed. I needed to give her a break from that intensity and it's been a slow recovery. I haven’t been back...yet. (It will happen again, just not now). So for the past two years, exercise been one of my biggest hurdles. I’m still tired most days of the week. I am not self-motivated to do something that I know is so good for me and makes me feel energized when I’m done. A couple years ago, I decided to try something. Anytime a friend wanted to get together, I suggested we chat over a walk. It’s an opportunity for us to connect and also an opportunity for me to move my body. And it’s worked. I have weekly connections with a variety of friends where we walk and talk. It’s not perfect, but it’s something. I walk with my friends Kristen and Donna one morning a week. My friend Kate and I fit in a walk whenever possible. My friend Amy and I will connect over a walk. My friend Christi who lives in Boston and I arrange walk and phone talk dates. My friend Kay who lives in California and I arrange walk and phone talk dates. If someone wants to connect with me, I suggest a walk over a lunch date whenever possible. My husband and I also walk together a couple days a week. It’s a win win for my friends and me & my hubby too! If you’re in my town, you’ll rarely see me walking alone. It’s not that I don’t like to walk alone. I know it would be good for me. But these days, especially in the winter, I need the accountability to actually get moving. Women might look at me and my passion for healthy living and assume it comes easy for me move my body, but it does not. It used to. But it does not anymore. And a full work schedule adds another layer. As does having 3 kids. BUT, I know exercise is good for me, so I figure out how to fit it in. In this season it's walks. But I've taken 10-week pilates classes, a restorative yoga series, group exercises classes...the goal is really to figure out how to take action in the direction you wish to go. 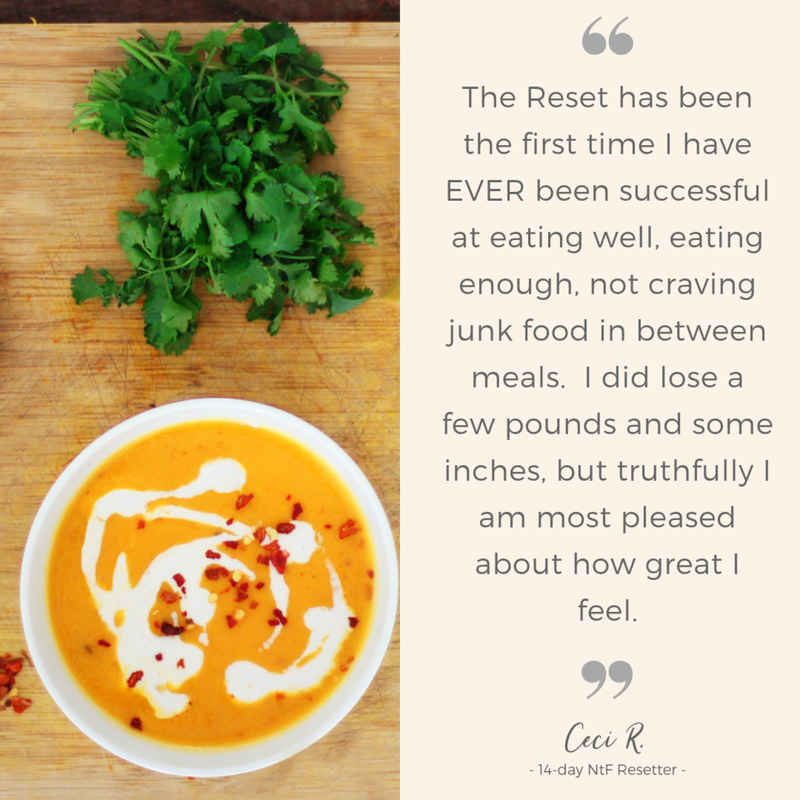 Last week, Angelle and I were talking with a business colleague who had been through our Fall Reset. She loved it so much she’s coming back to join us for our Winter Reset on February 3. We were talking about what makes this program so helpful. Yes, the plan is well-laid out. Yes the food is delicious and easy to prepare. Yes, the calls on cravings are light-bulb moments for the women. Yes, women get out of the program way more than they even knew they wanted or needed. But the vital piece is accountability. Because in many ways, just like my exercise routine, we can know something is good for us, but taking action on what is nourishing for us is a totally different ball game. We can declare what we want (weight loss, toned muscles, clearer skin, calmer spirit, organized home, weekly meal plan), but if we don’t take action, it’s not going to happen. Accountability helps us take action. It’s the main reason we offer this foundational Reset program LIVE in community and not as a self-study program you do on your own. We know the value of doing things alongside other women. Women showing up collectively at the same time to do the same thing to reach their goals. Getting daily coaching and support. As Stephen Covey says, Accountability breeds Response-ability. And maybe you see this in your own life? Maybe you can do something for just so long on your own before it fizzles. But when you add accountability it sustains you. It's what encourages you to show up day after day. Month after month. Year after year. I've had countless "empty nest" clients who made healthy meals every night while their kids lived at home. But once those kids left the house, they stopped cooking altogether. They realized feeding their kids gave them the accountability to cook healthy meals but now the accountability was gone. This is why the Reset is supportive for so many women. It’s not just a laid out step-by-step plan. It’s also a space of accountability that encourages you in your journey exactly where you are to take inspired action towards your goals. And Angelle and I have seen some serious magic happen by combining this very strategic plan withaccountability. Would you like support for this too? Our last Winter Reset begins next weekend. We'd love for you to join us! Newer PostHow's your New Year Resolution going?